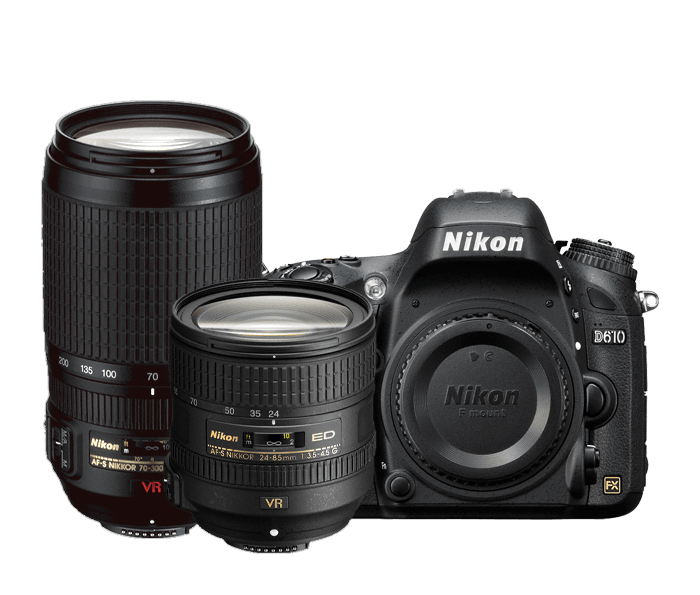 Get everything you need to take brilliant photos and video in a wide range of focal lengths from 24mm through 300mm, right out of the box: the D610 with the versatile AF-S NIKKOR 24–85mm f/3.5-4.5G ED VR lens, along with the powerful reach of the AF-S VR Zoom-NIKKOR 70-300mm f/4.5-5.6G IF-ED. A perfect match for the D610, these compact zoom lenses—both with Nikon's Vibration Reduction image stabilization technology delivers exceptionally bright, razor-sharp full-frame images to the D610's FX-format CMOS sensor. From wide–angle to portrait perspectives to long telephoto—whether shooting stills or Full HD videos—you'll draw peak performance out of your D610.